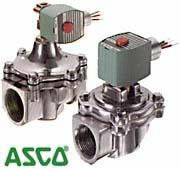 Asco Dust Collector valves have been specially designed for use in dust collector systems. The high-flow fast-opening 2-way valves are used for pulsing large volumes of air into filter bags for particulate removal. The new Power Pulse design offers extremely high flow, simple installation, and easy maintenance. In operation, a unique patented flow path results in a large per-pulse volume.